The Museum of Design Atlanta (MODA) opened its doors at its new Midtown location a mere two weeks and an opening to great fanfare it was! 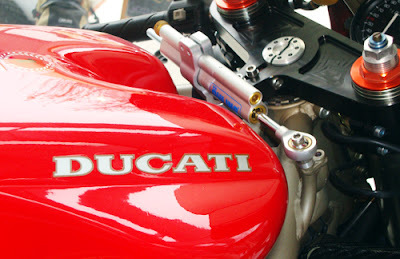 For me, seeing so many Ducatis and Agustas rekindled my attraction to and lust for motorcycles! You know how when you buy a new car and for the following several weeks, you notice every car on the road that is the same make as the one you just bought? Well, since going to see Passione Italiana: The Design of the Italian Motorcycle I've seen dozens and dozens of motorcycles driving around Atlanta! I wish it was because I had just purchased a new Ducati (photo), but it must be the influence of having seen the MODA exhibit. They're also engaged in a number of events, including a now weekly "Drink in Design" program on Thursday evenings. Last week's DiD included a guided tour by the curator of Passione Italiana and this week's will feature performance by Dance Truck! (not sure what that's about, but will find out through email, their website, Facebook, or Twitter - all of which you can easily sign up for! ).